What do you think of when you see a dandelion? “We filed past; our faces pressed against glass darkened to protect our eyes from the bright artificial light within. Ours had become a twilight existence. There was no time to stop, so the glimpse of our national treasure was all too brief. It is said that people once wanted it to disappear, but I don’t believe it. Why would there be a perennial queue to see the last of its kind? 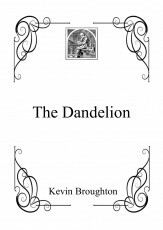 What would life be, without once looking on the beauty of a Dandelion?” That was what he told me the day we met. I had been walking across the field; hoping a story would come to me, and that's when I saw him. He was on his knees, next to the path; looking around him at the grass and everyday meadow plants. It was an overcast day, yet he wore dark glasses that were not merely tinted as sunglasses are, they were darker and they contrasted with his pale skin. From beneath the glasses I could see tears running down his cheeks. I asked him whether he was all right, and whether he needed any help. I didn't know what he meant by that, but he seemed very upset. I opted to sit with him for a while, to make sure he was okay. I reasoned that any muse worth its salt could find me just as well whether I was sitting or walking. “Where are you from?” I asked. He didn't answer, so I got out my notebook and my pen to jot down ideas for the next story. I had half a page of jottings when the answer came. I remember thinking what a silly thing that was to say in the field with the pylons running across it, and with the road and new estate in the background. Now that I know where he comes from, I no longer think if it as silly. I could not help but scribble down the words he spoke. “How do you know it failed?” I asked. He just looked around at the grass and at the houses nestled against the patch of woodland. I knew he was trying to look everywhere but at me, so I persisted in trying to catch his eye. He couldn't evade my gaze for ever and he gave in. “Because I failed,” he said, looking me straight in the eye. I'd met people who live rough before and they do come out with some fanciful stories. This was his; an alternative world to the one in which he lived. There was something in the way he said it though, something that told me he believed it. That's when he told me about his visit to see the last dandelion before he was sent back. As he did so he knelt down and looked at one of the thousand dandelions there were in the field. He looked up at me and said, “I'm still here, that's how I know I've failed. If I succeed, my world will never exist and neither will I. But here I am, spending each day looking at, and walking through paradise; knowing that each day I've once again failed to save it.” He bowed his head and said no more. He went from kneeling to sitting, and I sat with him. I just sat listening, unable to think what to say. “Back to where it might already be too late,” he said softly. Now it was my turn to avoid his gaze. I just sat and looked around, I wanted to reassure him and say that he was wrong, that we would pull through, but I didn't believe it myself. I became aware that he was looking at me as I looked around the field. Eventually, I shot him a glance. “I do believe you,” I mumbled. We sat in silence for a moment. I'm not sure he knew what to say, and I certainly didn't know what to suggest. I doodled and scribbled on my note pad, until I let out an involuntary laugh. “What is it?” he said, sounding hurt. He fell back momentarily on the grass, clutching his stomach. I put my pad down and quickly went over to him. “Are you all right?” I said, feeling foolish even as the words came out of my mouth. He got up and walked over to a lone tree, but he seemed weaker. I was sure he was not telling me everything. Still I had to admit that being left alone suited me. It was nice to get the interaction, but writing is a lonely business and I like it that way. I sat with the thoughts of the conversation and this stranger. I tried different ways to tell what had happened and what was to come, but none seemed to be as effective as the way he had told me. Looking around me at the grass, the flowers and in particular the simple yellow flowers that he found so endearing I knew how to start the story, and so it flowed easily. How to finish the story was a different matter. I needed to consult my muse again. As I got closer, I could see that he was much weaker than before. “What's the matter? What's wrong?” I asked. I did not want to finish the words, for I knew, as well as he did, that it would end his existence. I was wrong. The last word was written, but though weak, he was still there. “I promise,” I said. They were just two small words but they caused him to blink out of existence. It was then I realised that a story is worthless until it is read. Though I don’t know who you are, I do know you will save the future, and ensure that there will ever be a dandelion for those who care to stand and see its beauty. © Copyright 2019 Kevin Broughton. All rights reserved. This was beautifully written, and thought-provoking. It’s truly never too late. to the man who raised me, then left. This page was created in 0.4631 seconds.